I’m still going strong with my house-cleaning project. It’s amazing how much paper is all over this place. Whew! I have two. One upstairs and one on the ground level. 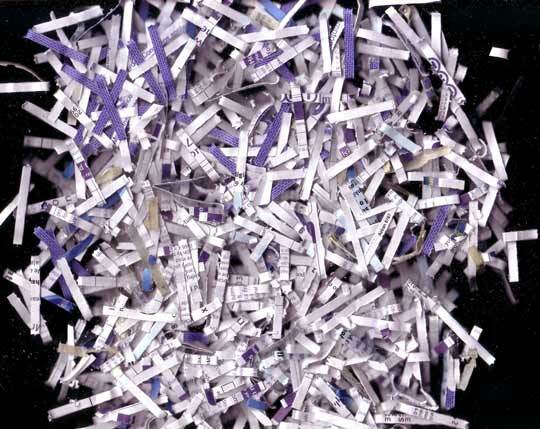 These are cross-cut shredders, and I use them to shred anything and everything that I don’t plan to keep that has my name, address and/or social security number on it. I can’t count the number of pre-approved credit card applications I’ve come across, along with book club membership applications. All that stuff gets shredded. Old statements and receipts get shredded. Envelopes with my name and address on them get shredded. Eventually, when I scan all the cards from special occasions, receipts and statements I’ve been keeping, they’ll get shredded, too. Tomorrow is trash day, and I was able to get a lot of stuff out of one of my computer rooms, so this is a good thing.